(CN) – The number of babies born to Muslims are expected to outnumber those born to Christians by 2035, leading to the world’s two largest religions having a near-equal share of the global population by 2060, a new demographic report says. The Pew Research Center says at present, Christians are the world’s largest religious group, with 2.3 billion adherents, and that is expected to be the case for the first half of the 21 century. Islam currently has about 1.8 billion followers. But according to the Pew Research Center report “The Changing Global Religious Landscape,” a Muslim baby boom is expected to narrow that gap. By 2060, Muslims are expected to comprise 31 percent of the world population, with nearly 3 billion people, while Christians will make up about 32 percent, or 3.1 billion people. Two years ago, Pew Research Center Demographers found that Islam is the world’s fastest-growing religion, and that Muslims will likely outnumber Christians by the end of the century. Pew researchers said religious conversions will certainly influence the numbers over time, but that birth and death rates have a far greater impact on religious populations. Signs of the rapid growth of the Muslim population are already visible. In the period between 2010 and 2015, births to Muslims made up an estimated 31 percent of all babies born around the world – far exceeding the Muslim share of people of all ages in 2015 (24 percent). 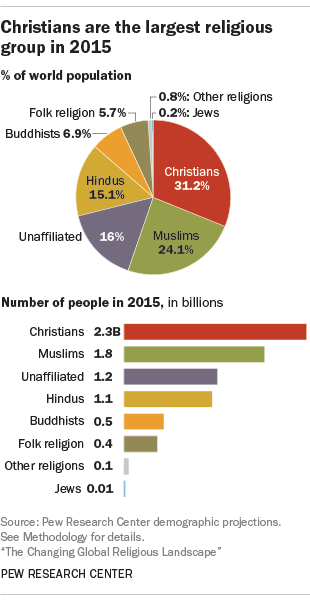 The world’s Christian population also has continued to grow, but more modestly. In recent years, 33 percent of the world’s babies were born to Christians, which is slightly greater than the Christian share of the world’s population in 2015 (31 percent). While the relatively young Christian population of a region like sub-Saharan Africa is projected to grow in the decades ahead, the same cannot be said for Christian populations everywhere. Indeed, in recent years, Christians have had a disproportionately large share of the world’s deaths (37 percent) – in large part because of the relatively advanced age of Christian populations in some places. This is especially true in Europe, where the number of deaths already is estimated to exceed the number of births among Christians. In Germany alone, for example, there were an estimated 1.4 million more Christian deaths than births between 2010 and 2015, a pattern that is expected to continue across much of Europe in the decades ahead. 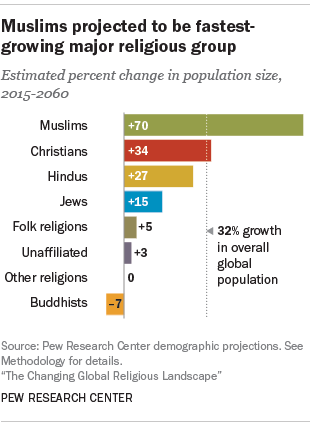 The study found the population of other faiths will also grow over the next several decades, but at a far slower rate than Muslims and Christians. In contrast with this baby boom among Muslims, people who do not identify with any religion are experiencing a much different trend. While religiously unaffiliated people currently make up 16 percent of the global population, only an estimated 10 percent of the world’s newborns between 2010 and 2015 were born to religiously unaffiliated mothers. This dearth of newborns among the unaffiliated helps explain why religious “nones” (including people who identity as atheist or agnostic, as well as those who have no particular religion) are projected to decline as a share of the world’s population in the coming decades. By 2055 to 2060, just 9 percent of all babies will be born to religiously unaffiliated women, while more than seven-in-ten will be born to either Muslims (36 percent) or Christians (35 percent), the study said.